Slid off left side of runway. MANKATO — Passengers reported no injuries Tuesday after a plane slid off a runaway on takeoff at the Mankato Regional Airport. Emergency services responded to 3030 N. Airport Road around 2 p.m. Airport Manager Kevin Baker said the twin-engine plane's four passengers were unscathed. 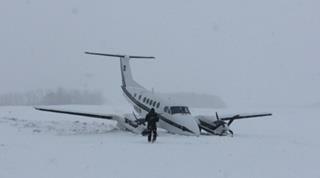 The group hoped to take off through the falling snow, he said, but ice underneath caused the plane to slip off the side of the runway.